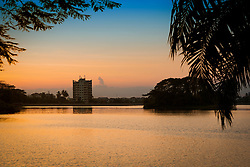 Inya Lake is the largest lake in Yangon, Burma (Myanmar), a popular recreational area for Yangonites, and a famous location for romance in popular culture. 6 miles (10 km) north of downtown Yangon, Inya Lake is an artificial lake created by the British as a water reservoir between 1882 and 1883 in order to provide a water supply to Yangon. 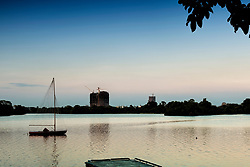 A series of pipes and cables distributes water from Inya Lake to Kandawgyi Lake near downtown Yangon.